= How is it going? First I’d like to tell you all how much I appreciate everyone who has been visiting my site these past 5.5 years. I started maggiesensei.com in fall in 2009. To be honest I wasn’t sure anybody would read my lessons so looking back I can now see how those initial lessons could be improved. So this year I would like to redo some of those lessons and supplement them with even more information. I revised one of my first lessons on this site, 挨拶（あいさつ) ( = aisatsu) . It is not common to shake hands or kiss on the cheeks when greeting people in Japan although they do shake hands on certain occasions. Also we sometimes see people who are supposed to be Japanese on TV or in the movies, greeting each other by putting both hands together palm to palm in front of their chest. Real Japanese never actually great each other that way. That’s just for the movies. Real Japanese people usually bow slightly to each other and smile . That’s called “会釈” = Eshaku. *こんばんは ( = Konbanwa) = Good evening. *おやすみなさい ( = Oyasumi nasai ) = Good night. Though we write こんにちは ( = Konnichiwa) and こんばんは ( = Konbanwa ) to our close friends in writing (letter, emails or texting), we don’t usually say こんにちは ( = Konnichiwa) and こんばんは ( = Konbanwa ) to family or close friends who you usually see all the time. *おっす！( = Ossu) / うっす！( = Ussu) / ういっす(=Uissu) (male speech / casual / rough ) Yo! Ex. どうもすみません ( = Doumo sumimasen) = I am very sorry. Ex. どうもありがとう ( = Doumo arigatou ) = Thank you so much. But this “どうも ( = doumo)” doesn’t mean anything. It is kind of vague greetings and just means “Hello”/”Hi”. おはようございます( = Ohayou gozaimasu) / こんにちは ( = Konnichiwa), こんばんは (= Konbanwa) when you talk to someone in a a superior position. = Itsumo osewa ni natte imasu. = Itsumo osewa ni natte orimasu. (Please see my お世話になります ( = Osewa ni narimasu) lesson. There is no equivalent phrase in English, and it changes depending on the scene but basically this phrase shows your appreciation to the listener. * はじめまして ( = Hajimemashite) Nice to meet you. = Hajimemashite. Yoroshiku onegai shimasu. = Nice to meet you. Note: Now, many of you knowよろしくお願いします ( = yoroshiku onegai shimasu) is a special expression that you say to people you are going to associate with. It has a connotation of showing your appreciation in advance for treating you well or for doing something for you and also asking for a favor to take care of you. Sometimes it implies “I may cause any trouble that I may cause.” If you say “Thank you in advance” in English, it may sounds a bit arrogant but よろしくお願いします ( = yoroshiku onegai shimasu) itself is a very humble and polite expression. = Douzo yoroshiku onegai itashimasu. = Kore kara osewa ni narimasu. = Thank you in advance for taking care of me hereafter. = It’s nice to meet you,too/ Likewise/ The pleasure is mine. / Same here. ★Ask how the listener is. = Dou, genki ni shiteru? = Hey, how are you doing? = Choushi wa, dou desu ka? You can reverse the order. Note: Check my 調子 (=choushi) lesson. = Minasan, ogenki desu ka? = Minasama, ogenki de irasshai masu ka? = Okusan wa ogenki desu ka? = How is your wife? = Okusama wa ogenki de irasshai masu ka? ★When you see someone who you haven’t seen for a long time. = Long time no see! = It has been a long time. You can repeat what they say. = Yes, really… It has been a long time. = I wonder how long it has been (since we last saw each other). = Donogurai atte inai kanaa. ★Ask how the listener has been. = How have you been? = Hai, okage sama de genki ni yatte orimasu. = Yes, I’m good. Thank you. = Yes. (I’m good) Thank you. = Un, genki. (Name) wa? = Yeah, I’m good. How about you? = Genki! Genki!! (Name) wa? = I’m great. How about you (name)? Note: そっち ( = socchi) means “there”. You should avoid using this with someone superior. = Hai, nantoka yatte imasu. = Yes, I’m getting by. = Hai, nantoka yatte orimasu. = Yeah, I‘m getting by. = Maamaa tte toko kana. = Well…(I’m getting by) / So-so. ★Asking about their latest news. = ~ wa dou desuka? = How is ~ ? = ~ wa ikaga desu ka? = ~ (no hou ) wa dou? = Shinkon seikatsu wa dou? = How is your newly wed life? = Taichou wa dou desu ka? = Okarada no hou wa mou daijyoubu desu ka? = Are you feeling all right now? = Taichou wa mou daijyoubu? = Atarashii ie wa ikaga desuka? = How is your new house? = Oshigoto no hou wa dou desuka? = Shigoto wa umaku itteru? = Are you doing OK at work? = Okosan wa ookiku narimashitaka? = Has your chid grown bigger? = Kare tow a nakayoku yatteru? = Are you getting along with him (your boyfriend)? = Yeah, it is going well. = Yes, I am getting by. If you have had some trouble but you don’t want to talk about it so much. The following simply hint that you’ve had some trouble. = I have had some troubles. = Things are not so easy. = So many things have happened. = It’s a long story. Talking about the weather helps the conversation go smoother. Usually your communication goes smoother when you have the common topics. After saying hello, you can mention the weather. = Ii otenki desu ne. = Nice weather we’re having. = Kimochi no ii otenki desu ne. = The weather is pleasant, isn’t it? = It rains (snows) a lot, isn’t it? = It rains (snows) a lot, doesn’t it? = Otenki ga warukute komarimasu ne. = It is annoying weather, isn’t it? = It’s hot isn’t it? = Atsui hi ga tsuzukimasu ne. = It has been hot, hasn’t it? = It is very hot and humid, isn’t it? = It has been humid. = It’s cold, isn’t it? Note: So you just say hello and mention the weather as a greeting. = Hello, it’s hot, isn’t it? = It is. / You are right. or repeat what they say. = Hontou ni atsui desune. = You are right. It is really hot. ★Say thank you if that person has done something for you. It is polite to mention it after saying hello. = Konnichiwa! Senjitsu wa arigatou gozaimashita. = Hello, thank you for the other day. = Konoaida wa, osewa ni narimashita. = Senjitsu wa, musuko ga osewa ni narimashita. = Thank you for taking care of my son the other day. = Ohayou! Kinou wa arigatou! = Good morning! Thank you for yesterday. You say さようなら ( = sayounara) at school (teachers and students) and in “some” daily conversations. However, if you live in Japan, you may notice that you don’t hear people saying さようなら ( = sayounara) so often. Part of the reason is that the word さようなら( = sayounara) / さよなら( = sayonara) sounds like you don’t see that person anymore. It may be similar to “Farewell” in English. It sounds very formal or distant. That is why you hear the word often in a break-up songs in Japan. = I’ll see you tomorrow. = I’ll see you next week. If you don’t know when you are going to see that person next. = I’ll see you then. = Soredewa oki wo tsukete. = Please take care, then. = Jaa, ki wo tsukete. = Jaa, ki wo tsuketene. If you leave earlier than other people. = Osaki ni shitsuresi shimasu. = Allow me to leave earlier than you./ I am sorry that I am leaving earlier. = I’d better be going now. = See you./ I’m off. = See ya’ ? I’m off. = Excuse me. I’d better be going now. To a person who say お先に ( = osakini) or leaves earlier than you. = (literal meaning) Thank you for your hard work. = Good work today. / See you. 1) You can say 行ってらっしゃい (= Itterasshai) when you see your neighbor (who you know) is going somewhere. *When someone comes back home or to a workplace. = Yoi shuumastsu wo sugoshite kudasai. = Please have a nice weekend. = Have a nice weekend. = Soredewa tanoshii natsuyasumi wo osugoshi kudasai. = Please have a fun summer vacation. = Have a fun summer vacation. = OK, have fun over summer vacation, all right? = Jaa, ryokou, anoshinde kite. = OK, then have a nice trip. = Jaa, ki wo tsukete itte kite. = Have a safe trip, OK? = Goshujin ni yoroshiku otsutae kudasai. = Naoto kun ni yoroshiku. = Say hello to Naoto. = Demo watashi no ichiban seishikina aisatsu wa hito no kao wo nameru koto desu. = But my most formal greeting is to lick people’s face. how to use Vte form+Orimasu. I always hear it in movies for formal greetings. then instead of ” to iimasu” i usually hear “te” I don’t know if they are the same in meaning. thank you so much Sensei. It’s 謙譲語(kenjougo) an honorific expression and make yourself sound humble when you talk to someone superior or customers. Everything here is perfect. Quality content, well written lessons. I just wan’t to thank you for your amazing website. Arigatou！ for your kind words! Thank you for your nice comment!! 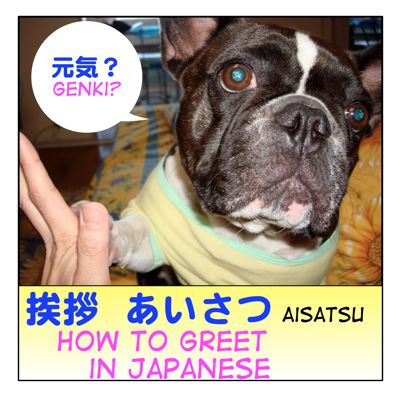 Hope you learn many ways of greetings in this lesson! I understand what it means, I am just not sure if my original sentence sounds unnatural or it was wrong. Can you tell me if it was okay? I think it is because 最近 & 気に入っていない together doesn’t sound natural. Ohh, ok. Thanks! Why can’t I use 最近 and 気に入っていない together? Could you give me a brief explanation if it isn’t too much trouble? but you can say “I like this (specific) movie” この映画が気に入っている. Also though we use the pattern 最近〜ていない I haven’t doing something lately (Ex. 最近、日本語の勉強をしていない）because 気に入る is not an active verb. OH! got it! Thanks a lot! You’re great! = Osaki ni shituresi [shitsurei] shimasu. can you make a lesson about the differences among sai, toki, koro? I have been already working on how to say “when” in Japanese. I will include those. I’m so happy to know that..